These rogue cell sites have various capabilities, from being able to track an individual phone, gather metadata about who you have been calling and for how long, to much more invasive surveillance such as intercepting SMS messages and what websites you’re visiting on your phone. The EFF calls them cell-site simulators, and they’re an incredible violation of privacy. While there was most certinaly several of these devices at DEF CON, I only saw one in a hotel room (you catchin’ what I’m throwin here?). No matter where the threat comes from, rogue cell towers still exist. Simply knowing they exist isn’t helpful – a proper defence against governments or balaclava wearing hackers requires some sort of detection system.. For the last few months [Eric Escobar] has been working on a simple device that allows anyone to detect when one of these Stingrays or IMSI catchers turns on. With several of these devices connected together, he can even tell where these rogue cell towers are. Stingrays, IMSI catchers, cell site simulators, and real, legitimate cell towers all broadcast beacons containing information. This information includes the radio channel number, country code, network code, an ID number unique to a large area, and the transmit power. To make detecting rogue cell sites harder, some of this information may change; the transmit power may be reduced if a tech is working on the site, for instance. 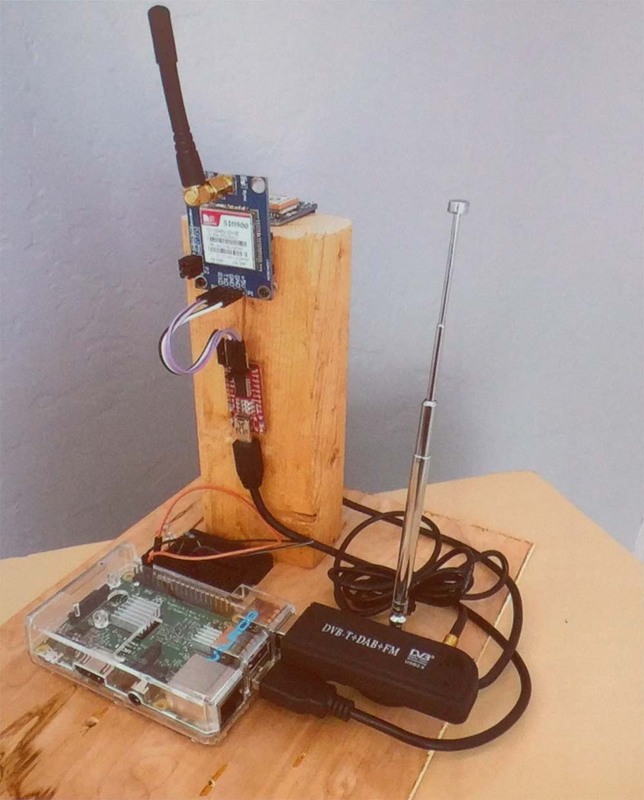 To build his rogue-cell-site detector, [Eric] is logging this information to a device consisting of a Raspberry Pi, SIM900 GSM module, an Adafruit GPS module, and a TV-tuner Software Defined Radio dongle. Data received from a cell site is logged to a database along with GPS coordinates. After driving around the neighborhood with his rogue-cell-site detector sitting on his dashboard, [Eric] had a ton of data that included latitude, longitude, received power from a cell tower, and the data from the cell tower. This data was thrown at QGIS, an open source Geographic Information System package, revealing a heatmap with the probable locations of cell towers highlighted in red. This device really isn’t a tool to detect only rogue cell towers – it finds all cell towers. Differentiating between a rogue and legitimate tower still takes a bit of work. If the heatmap shows a cell site on a fenced-off parcel of land with a big tower, it’s a pretty good bet that cell tower is legit. If, however, the heatmap shows a cell tower showing up on the corner of your street for only a week, that might be cause for alarm. Future work on this cell site simulator detector will be focused on making it slightly more automatic – three or four of these devices sprinkled around your neighborhood would easily allow you to detect and locate any new cell phone tower. [Eric] might also tackle triangulation of cell sites with an RF-blocking dome with a slit in it revolving around the GSM900 antenna.